Mark and I left our isolated, pretty anchoring spot near the reefs NW off Opunohu Bay to move deep into the bay. Here, in the deeper and darker water, we were surrounded by the impressive scenery ashore and we had easier access to some hikes in the Moorea's interior. The Belvedere is one of the highlights for tourists visiting this popular and beautiful island. A road gently slopes towards and impressive viewpoint, where people gather to take pictures of the surroundings. A bench is strategically placed in the shade; it should be reserved for the ones huffing it up by foot. :-) Mark and I started out walking on the sunny road, but once we reached the marae (archeological site), we picked up a trail leading to the Belvedere. We could chose: road, sun, traffic - fumes, noise and being “pushed” to the side – or path, shade and mosquitoes. We picked the second option, applied bug repellent, and had a nice walk up. From the Belvedere, two trails start in different directions, branching off to more points along the way. None of these trails have signs (they want tourists to hire a guide), so you take a bit of a risk not knowing where you will end up. We started west, thinking we would reach another bench and then somehow end up back down in Opunohu valley. We found the bench with a nice view, but after completing somewhat of a circular route, ended up back at the Belvedere. Huh? Looking for an alternative way to descend, we backtracked the trail we had arrived on and took a split, away from the main route. It was a lovely hike through the forests, with an unexpected and impressive open view once we reached a pineapple plantation in the valley. Since the trail seemed to have vanished, we followed the dirt access road which ended up on the “Route de Ananas”. Not knowing where to pick up another track to the bay from there, we were “forced” to walk back on the steaming hot asphalt road back to the dinghy. We have more exploring to do in regards to trailheads! We could see a steep trail leading down on the other side of “trois pins”, but according to our Moorea map in Lonely Planet, the path we were looking for, went the other way; a split from the trail we arrived on. So, we headed in that direction, and started hiking, up and down, along the mountain range. Before long, Cook’s Bay was a body of water in the distance, only getting smaller with every step we took. Not willing to believe that we hooked up with a well-kept, but non-existing trail according to all the maps, we kept on walking, our feet slanted on the narrow side of the mountains. The path would have to bend back and down soon, for sure! Nope… More and more it started to dawn on us that we were headed for the pass overlooking Vaiare, the top of a mountain we had climbed up and over a few weeks ago. It was located on the east side of Moorea. At least we knew how to get back to Cook’s Bay from there! A couple of hours later – hungry and thirsty (we weren’t prepared for a day hike) – we reached the Vaiare viewpoint. This time, unobscured by rain and mist, we could see the surrounding peaks and Vaiare Bay. Who would have thought we’d ever make it back up here? A very steep descend followed, while we were holding on to tree trunks and roots. The last part of the walk was easy and flat, but the rain had returned! Luckily, the little snack bar in Pao Pao (at the head of Cook’s Bay) still had sandwiches for a late lunch and while waiting for the grocery store to reopen (long lunch breaks in French Polynesia), a surprise visit from our friends Lili and Steven on SV Liward caught us off guard. They had taken the ferry over from Tahiti for their anniversary, rented a scooter, and had been trying to find us for hours. 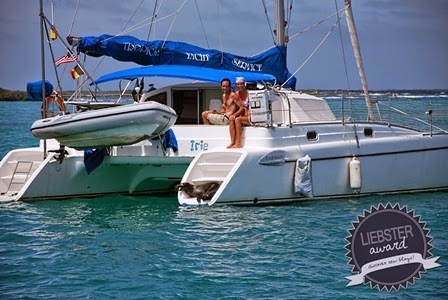 Since they couldn’t see our dinghy on Irie, they figured we would be “somewhere” on the island! And, they were right… Soaked in sweat, we were sitting on the curb of a local grocery store, while our purple umbrella drying in the meager rays of sun had drawn their attention! Opunohu Bay at sunset - we cannot get enough of the view here! Some of the trees in the forests are huge! 180 degree view from "trois pins"
The other 180 degree view from "trois pins"
The Liebster Award is an unofficial award given by cruisers to cruisers to bring awareness to their blogs and to promote stories and blog posts about the cruising lifestyle. Although I have yet to see the Liebster Award actually being awarded, it all seems to start with nominations. 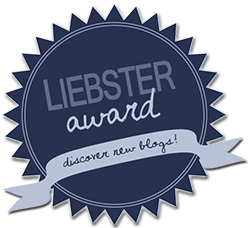 When you are nominated for the Liebster Award by a person who enjoys reading your blog, you are to send thanks to your “awarder” by posting a link to his/her blog site, answer ten questions posed to you (and to 5-10 other blog writers they nominated), and nominate up to ten blogs you like or think that stand out by asking those writers ten new questions. These nominations can be accepted, declined or ignored, and although this method seems to present a modern form of chain letters (or an innocent “pyramid scheme” according to Mark :-)), the whole exercise is good-humored, harmless, relaxed and a fun thing to do. This tradition will get the word out about blogs that are worthwhile and will hopefully provide the readers with an amusing and interesting insight in the cruising life. 1. Where are you and your boat right now? 2. What do you like best about cruising? The wildlife encounters, the peacefulness, the adventure, the gift of time, being one with nature, the different cultures, islands and sights we get to experience and see – something that might be impossible otherwise because of their location and prohibitive cost to visit. 3. What three items can you not live without on your boat? 4. What is the best piece of equipment you have bought for your boat in the last year? New jib and new anchor chain; again both needed. We only buy things for the boat that are really required. 5. Do you jump into the water head first or feet first? Tippy toes first! Feet first when it has to go quick; head first when naked (otherwise I lose my bikini). 6. What is your favourite sun downer tipple? 7. What makes an ideal anchorage for you? 8. Where is your favourite anchorage? 9. What hobbies or pastimes do you have when not doing boat maintenance? 10. What is your favourite knot? If you don’t know how to tie a knot, tie a lot! But, the bowline remains my favorite! 1. What was the defining moment when you knew that you had to set sail? Buying Irie in Annapolis in 2007, discovering that our dogs Kali and Darwin liked the catamaran, receiving my Greencard (which we only needed for me to stay long enough until Irie was ready to go, but we were ready before the Greencard arrived) and sensing new adventures. 2. What's the one comfort you wish you had while cruising? 3. How long do you plan to be out? Is it until the money runs out or are your plans finite? Until we are ready to do something different, but not less exciting. 4. What is the most awesome place you have visited so far? 5. What is the least awesome place you have visited so far? 6. What advice would you give our family as we're about to set out? Don’t go overboard preparing and equipping your boat if it means postponing your departure – you will figure things out along the way and prioritize by experience which items are required for your life aboard. Also: don’t rush anywhere, try to avoid being on a schedule, and take the weather into consideration – always! 7. What is the one place that you can't wait to visit? There are just too many (only some of them boat-related)… But, let’s just say Tonga for now. All of the above amongst both of us. 9. Do you ever get sick of your crew? What do you do for personal space on a boat? This is a toughie… :-) No, we don’t get sick of each other. When I need personal space, I go down into one of the hulls or go for a swim; when Mark needs personal space, he just (mentally) blocks me out and focusses on what’s on hand. 10. What is the one non-essential item on your boat that you would not want to live without? 1) What prompted you to start cruising? 2) What is your ultimate goal with this adventure (reaching a certain destination, circumnavigation, personal achievement …)? 3) Name five things you do every day on your boat that you wouldn’t do if you were to have a different lifestyle. 4) How do you make your relationship work onboard? 6) What is the boat chore you dread most? Feel free to mention more than one! 7) What do you love about your floating home? 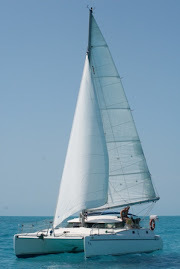 8) What would you change about your boat if money is not an issue? 9) Which anchorage do you prefer: a snorkeler’s dream or a hiker’s paradise? 10) What has been your personal highlight since living aboard? And your personal nightmare?